On a low income, you may be able to get help with the cost of sight tests, glasses and contact lenses through the NHS Low income Scheme. You are only allowed an examination at intervals recommended by your eye-care practitioner or if you are experiencing any eye problems or health issues connected to your eyes before you are due. Here in Wales an additional specialist service has been set up in conjunction with the Welsh Assembly Government to provide free eye-care for certain selected groups of patients who may be at higher risk of eye disorders, as well as patients who develop a sudden eye problem. Our Optometrists have undergone further training to enable The Optic Shop to offer The Eye Health Examination Wales (EHEW). If you are in any doubt about whether you qualify for an EHEW or if you are worried about any eye symptoms please do not hesitate to ask us for advice. Most Opticians will have your glasses made up in an outside laboratory, costing precious time. At The Optic Shop our on-site glazing facilities allow for the technicians to process orders quickly and individually, with a one hour service available in many cases. If you require a more complicated correction we will order your lenses in from our UK based lens suppliers. They offer the latest advances in digital technology and coatings providing patients with the best possible quality of vision. Once we have your lenses we align them in your chosen frame, and cut and edge them to fit. With a fully equipped in-shop laboratory and expert staff, we can also offer instant advice and, fast frame adjustments, cleaning and minor repairs. Pop in anytime for a general spectacle MOT! Total Care is available to all of our contact lens patients who are on our direct debit scheme. Here are the great benefits that members are entitled to. We believe that out of all of the age groups children’s eyes are the most important, but sadly only 53% have had an eye test. Eye tests are particularly crucial early on, as detecting problems can help vastly in the future, from reading their first words, to taking their driving test. 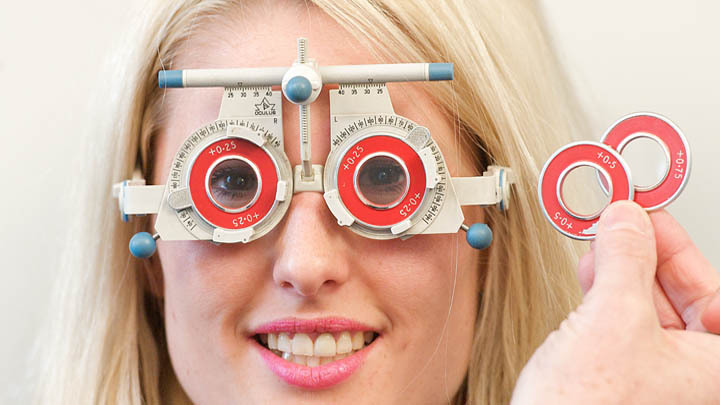 Regular eye tests are advised as the eyes can alter rapidly during the growing years. Most infants and toddlers will have eye checks as part of their routine health examinations but we advise that they should have their first visit to an optician around the age of three. The eye test will be child-friendly and easy, making it a quick and enjoyable experience. Of course at The Optic Shop children go free – with a fantastic collection of fun frames including No Fear, Peppa Pig and Ben 10 to choose from, and for the more discerning teenagers we have a wide range of stylish frames. Children under 16 qualify for free examinations funded by the NHS and these are available at repeated intervals recommended by your optician. This free service is extended to all under 19, as long as they are in full time education.